Ganglions Excision is the surgical removal of a mass or cyst that is generally attached by a stalk of tissue to a nearby joint capsule, tendon, or tendon sheath (tissue covering the tendon). Wrist ganglions are attached to the wrist joint capsule. Typically only one ganglion appears, often in a location that is predictable to doctors. However, ganglions have been seen in almost every joint in the hand and wrist. Most ganglions form a visible lump; however, smaller ganglions can remain hidden under the skin. Although many ganglions produce no other symptoms, if a cyst puts pressure on the nerves that pass through the joint, it can cause pain, tingling, and muscle weakness. Ganglion Excision Surgery involves removing the cyst as well as part of the involved joint capsule or tendon sheath, which is considered the root of the ganglion. Even after excision, there is a small chance the ganglion will return. 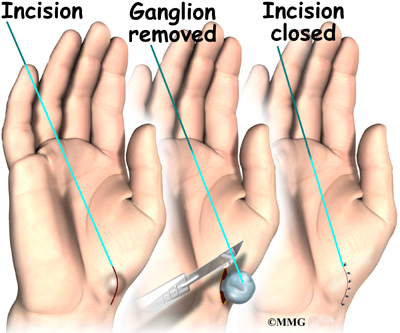 Excision is the most common surgery for a Ganglion. Removing the cyst is usually effective if the stalk that connects the cyst to the joint capsule and a bit of the surrounding capsule is removed. The surgical procedure is basically the same, except the volar ganglion is usually very close to the radial artery (the artery in the wrist used to feel someone’s pulse). In some cases, the volar ganglion even winds around the artery. This makes removing the ganglion a bit more difficult. The surgeon must be careful to protect the artery, while at the same time removing the cyst down to the joint capsule, just like with the dorsal ganglion. Ganglion Excision is typically an outpatient procedure and patients are able to go home after a period of observation in the recovery area. There may be some tenderness, discomfort, and swelling after surgery. Normal activities usually may be resumed 2 to 6 weeks after surgery.